With flu season upon us, Dr. Ivons will share some of the less common, but important, presentations of Influenza and the remedies that cover those pictures. 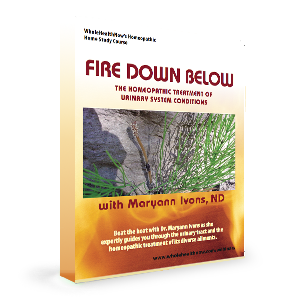 *Participants in the Fire Down Below course with Maryann Ivons may earn 1 Homeopathic Educational Hour with this session! One out of five women will develop a urinary tract infection at some point in their lives. In the U.S., cystitis alone accounts for 6 million women visiting the doctor each year. For many people, especially those stuck in the antibiotic cycle, urinary tract infections can become a veritable plague, relapsing or recurring for years. Antibiotics may be effective in many of the bacterial cases, but antibiotics are also one of the biggest risk factors for developing problems in the urinary tract in the first place. Homeopathy often treats conditions of the urinary system just as quickly and effectively as antibiotics, but without the risk of frequent and long-lasting recurrences! Join Dr. Maryann Ivons for a six-session course this Spring on treating urinary tract conditions with homeopathy. You will review the anatomy and physiology of the urinary tract, learn to differentiate infection from inflammation, examine the materia medica of the urinary tract, and review the useful rubrics pertaining to these conditions. Each segment will include materia medica and cases compiled from Dr. Ivons' 28 years as a family practitioner. PLUS! A free bonus session... see details above. Dr. Ivons started her medical career as an emergency room and intensive care nurse before becoming a naturopathic physician in 1987. She has been practicing homeopathy ever since, has lectured at Bastyr University and the Seattle School of Homeopathy and served as Dean of Academic Affairs for the American Medical College of Homeopathy. She is also the author of Homeopathy for Nurses and a contributor to Vogel and Krucoff’s Integrative Cardiology. which are not specifically MP3 compatible. Want Online Access and DVDs? If you are interested in accessing the course online (which grants Homeopathic Education Hours), as well as having a DVD copy of the course (which lasts for years to come), we have a special option for you. Once you are enrolled in the online portion of a course, check the course page. At the bottom of the page is a link to buy the DVDs at the special price of $85. Note: The price you see when you register, is the price you will be charged. A multimedia presentation with simultaneous computer and audio conferencing. Online review and self-assessment quizzes for each session. Documentation of Homeopathic Education Hours* - The full completion of this course + Bonus Session provides 13 hours of Homeopathic Education. Access to our WHN Course website. Case assignments and Repertorizations may be posted at the discretion of the instructor. An attractively packaged set of professionally edited recordings with handouts in electronic form, DVD and CD in MP3 format will be sent to you when they are produced at no additional charge. Each session is recorded and posted on the private course website for your review at your convenience. *To receive Verification of Attendance: You must watch the recorded sessions, and complete all quizzes with a score of 80% or better within your 6 months access to this course. Please be sure to print and safeguard your Letter at the conclusion of the course. Partial course credit is not given for WHN courses. Discs will be produced for this session. Dr. Ivons was my instructor in homeopathy during Medical school at Bastyr. She is an articulate, dynamic speaker, and knows how to make learning fun. She has a knack for bringing the student back to key content, and facilitating thinking in a way that provides tools that are crucial as a clinician in medical practice. I enjoyed her, and valued her as a teacher enough that I added every possible clinical shift and elective that she taught. Even eleven years into my own medical practice, I continue to call on Dr. Ivons for guidance with difficult cases. She always assists with care and humor. I find her invaluable as a teacher, a colleague, and a friend. Dr. Maryann Ivons is one of my all-time favorite teachers. She combines a very practical approach to the material with a wealth of experience. I would highly recommend any of her courses and I guarantee you will walk away with many clinical pearls you can put into practice. Maryann Ivons has been my teacher and mentor for over 10 years. She is a solid foundation of knowledge and practicality. As a student, the homework I received from her helped me establish treatment protocols for my future patients. As a mentor, she is always insightful, understanding and patient. She helps remind me about the roots of our medicine and the powerful outcomes it has on patients. I am so grateful for her guidance and teachings. I am honored and extremely blessed to have been a student of Dr. Maryann Ivons. She is brilliant, talented, gifted and a blessing to the homeopathic world. Dr. Ivons is an amazing teacher and educator. She is gentle and genuine, sincere and insightful and positive with a wonderful attitude about life. She walks her talk and always does what she says she will do and then some. She has a way about her that touches every life that she crosses and leaves you energized yet balanced and at peace. She brings strength and passion to all that she does and I highly recommend her for all of her skills, talents and gifts. She rocked my world in a beautiful way! Thank you Dr. Ivons for all you have done for me! I am so grateful for you! Fire Down Below is another in WholeHealthNow's ongoing At-Home Learning Series, offering high-quality, affordable homeopathic education.